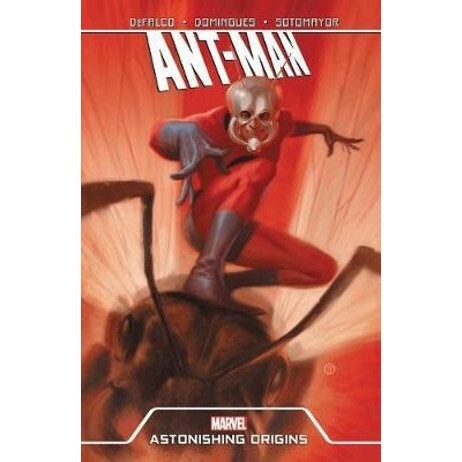 Legendary writer Tom DeFalco and acclaimed artist Horacio Domingues bring you the origin of Ant-Man! Hank Pym has had a life full of adventure and success, failure and humiliation. He's been known by many names, and played many parts - scientist, super hero, flawed husband. What demons drive a man like Hank Pym? And how did he begin his heroic career? Discover the story of the man behind the myth, and the fears and paranoia that propel him to great heights - and the darkest depths! Plus, Hank's successor as Ant-Man, Scott Lang, steps into the spotlight! He's never exactly been the world's best super hero - heck, most people don't even think he's been the best Ant-Man. But when Lang gets a once-in-a-lifetime opportunity, it may be the start of an astonishing future!